Babblings of a Mommy: Think PINK @ Panera Bread. Think PINK @ Panera Bread. 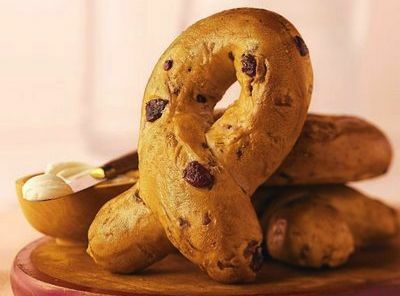 Every year throughout the month of October, Panera Bread donates 25 cents of the proceeds from the sale of Pink Ribbon bagels for cancer research! But this year, THINK PINK is taking it to a whole new level! Panera Bread Orlando is going PINK on Friday October 1st 2010. Come into any of the 31 Central Florida Bakery-Cafes on THINK PINK day to show your support! Panera Bread is donating 100% of the proceeds from the sale of all Pink Ribbon Bagels to MD Anderson Cancer Center and Wuesthoff Women Center. 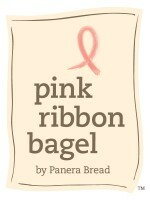 Our goal is to sell 25,000 Pink Ribbon bagels on Friday October 1st!!! Come in and show your support. In addition, Friday October 1st, Panera Bread of Orlando will be giving away 1,550 FREE Mammograms!!!!!!! Each of our 31 cafes will have 50 free mammogram certificates to give away with the purchase of a Pink Ribbon Bagel and a Pink Ribbon Travel Mug. The proceeds go to a good cause and the certificates are transferable. Love this idea! Great 'twist' on a classic product for BCAM. We've put together our own collection of pink office supplies at Shoplet, and we're excited to see how many companies are on board with their own products to support BCAM.